Ever since I was a little girl, I have longed to see the Galapagos. My parents lived in Ecuador before I was born and to this day will not shut up about their visits to these magical islands full of amazing creatures. Embarrassing fact: both my mother and father still call me variations of the nickname ¨boopie¨ after the blue footed booby, a bird they once saw there. Over the next few days, my sister and I will finally get to see what all the fuss is about when we visit the islands with our mom. In preparation for this trip of a lifetime, I have done very little research. After wandering around Guayaquil all day, though, I got to thinking about—what else—trash and recycling. The boardwalk in this city is shockingly developed, lined with perfectly manicured patches of tropical vegetation and freshly painted playsets for children. There are police and trash bins every few hundred feet and even large paper, plastic and glass recycling bins at the major entrances (photos forthcoming). Not at all what I´d expected. Then again, at the nearby iguana park, tourists wander unregulated, posing with, poking and feeding junk food to the lizards and littering indiscriminantly. Anyway, on the eve of my Galapagos adventure, I find myself camped out in the hotel business center (charging the various devices I seem incapable of traveling without and) searching the terms ¨trash¨ and ¨galapagos¨. So far, the two most interesting results mirror my high and low reactions to solid waste disposal in Guayaquil this afternoon: a write up on Treehugger last year heralding an innovative recycling venture and several blog postings from a self-described Galapagos-based vegan priate criticizing the government of Ecuador for doing little to regulate illegal dumping and animal smuggling. I will let you know what I see for myself in a few days. Hasta pronto, compañeros. Hi, it’s Leila. I’m sitting in the Miami airport waiting to board my flight to Guayaquil, reading the paper and attempting to blog via smartphone. If you haven’t yet, check out the NYT story on the failing recycling industry in China. The news hook isn’t new, but the profile of a trash collector named Tian Wengui is. Leila is in Ecuador this week and Victor is in the process of relocating from Stockholm to NYC for six months. Please excuse us if posts are light this week. Thank YOU Nancy. Garblogging is fun in and of itself, but it’s exciting to get proof beyond web stats that people out there are getting something out of everydaytrash. 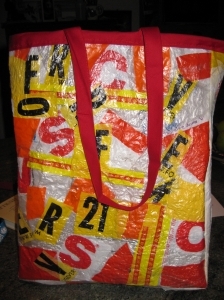 P.S., that CVS/Forever 21 mash up bag is rad. Keep us posted on the fusing madness. Rich and Bob started YouRenew.com out of their dorm room at Yale. The site promotes a concept they coined: recommerce. AKA recycling incentives. Basically, it’s a directory of how to get paid to recycle your electronics. Thoughts? And of course, This American Life has devoted an entire show to our favorite topic. Have a listen to the garbage episode, first aired back in ’05. Recently, I’ve become addicted to back episodes of This American Life. 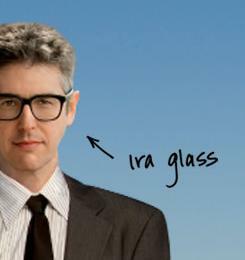 It’s a cliche of my demographic, I know, but I heart Ira Glass. This morning, while rooting through the onlne archives, I found this show, which includes an opening segment on the Great Pacific Garbage Patch. In it, Ira talks to an environmental sea captain with his own Web site on the topic of trashed bodies of water and efforts to restore them. Today is the last of three days of scientific discussions on climate change, held between some 2 000 experts in Copenhagen. Obviously, with so much brains in the room(s), summarizing outcomes is quite the challange, but the intrigued should check out the conference website for online abstracts. Later, a book will be published to be handed over to our mighty policy makers at the United Nations Climate Change Conference (COP-15), also to be held in Copenhagen, in November-December 2009. As we know, the COP-15 iwill be the site for negotiating the post-kyoto protocol, so this book should be valuable input. unconsumption is a side project in the form of a tumblr started by Rob Walker, author of the weekly Consumed column in the Times magazine. It is also a concept tackled in some depth on his blog, Murketing. I think you’ll enjoy these links. 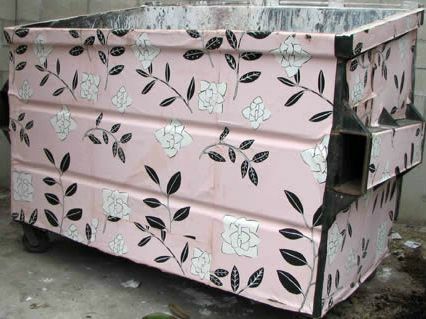 Check out C. Finley’s clever and trashy street art, wall papered dumpsters. On a mostly unrelated note, I saw a racoon (at least I hope it was a racoon, it could have been a very large possum or a big freaky rat on steroids) at the corner of Smith and Bergen last night. It looked like it was about to walk down the steps to the F train platform, but some people walked by (without noticing it) so it ran under a car instead. I imagine it was checking out curbside dining options from all the restaurant trash bags on that block. I’ve seen racoons in Brooklyn before, but never one that looked like it might get on the Subway. Check it, a trashy Donky Kong-esque game some guy made for a school project on the environment. I hope he got an A. To demonstrate the huge amount of recylclables that end up in the garbage at the University of Missouri, a group called Sustain Mizzou had a forklift drop four tons of trash bails in the center of campus and stood on top of it. They called the project trash mountain. This clever group has a host of ongoing awareness projects, including an initiative to offer recycling at tailgating events. Even their Sustain Mizzou t-shirts are recycled, a great idea for any trashie team. Rock on kids. And seriously, get some help with your Web site. All these neat projets should be better showcased online! 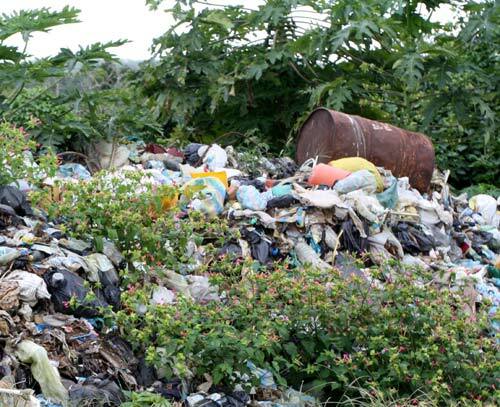 Where there was once a dump, there is now green space. 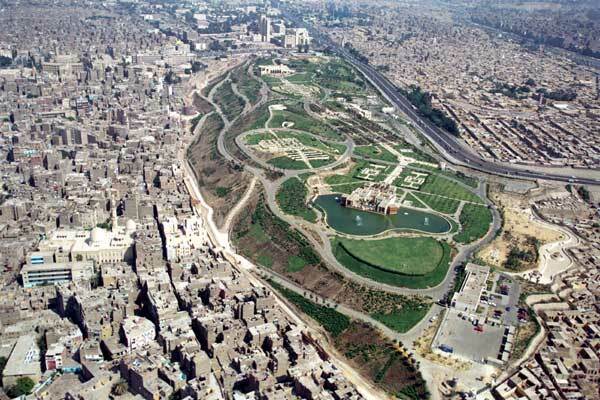 Al-Azhar Park in Cairo, Egypt grew out of a project of the Aga Khan Trust for Culture, aimed at revitalizing the Darb al-Ahmar neighborhood and restoring and showcasing the area’s historic art and architecture. For the full story of this transformation, check out this fantastic post from City Parks Blog, complete with links to a PBS video. One estimate cited in the project overview found that the amount of green space per resident of Cairo was about a footprint before Al-Azhar. I hope it’s a little better now.